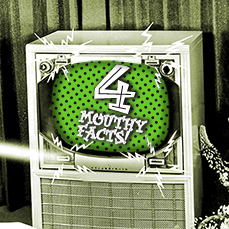 Amaze Your Friends With Four Amusing Mouth Facts! DID YOU KNOW THAT THE WORD “DENTIST” comes from “dent-” which is French for “tooth”? Funny thing is, we deal with a lot more than just teeth! That’s because the health of your teeth is so tightly connected to the health of your whole mouth (and even connected to the health of your whole body). You know that little piece of webbing that connects the base of your mouth with the underside of your tongue? It’s called a frenulum. And, there’s another major one in your mouth. Can you think of where it is? That’s right… It connects your upper gums to your top lip. There is a special kind of tissue that lines your entire mouth called the oral mucosa. In some places (like on the roof of your mouth) it’s mixed with keratin, which is a strong material also found in our fingernails. Your upper and lower jaw are connected by temporomandibular joints. Most of the joints in your body (for example, your elbow) only move in one direction. Your jaw, however, moves up and down, side to side, AND front to back! This helps our molars grind our food. Move your own jaw in a circle right now. Your pet cat (a carnivore) can’t do that nearly as well as a human! We have three major pairs of salivary glands, and other small ones located throughout our mouths. Did you know that saliva does more than help us eat and clean our mouths? It also contains important minerals that reinforce our teeth. As your lifelong oral healthcare provider, we check more than just teeth. We’re very interested in your gum health, the alignment and balance of your jaw, and early signs of problems like oral cancer in the soft tissues of your mouth and throat. Thank you for the trust you place in us. We deeply appreciate it. Remember, if you ever have any questions about your teeth or mouth we’re here to help—so please ask us! We look forward to seeing you the next time you visit.